The DTs with their last samples for the month. 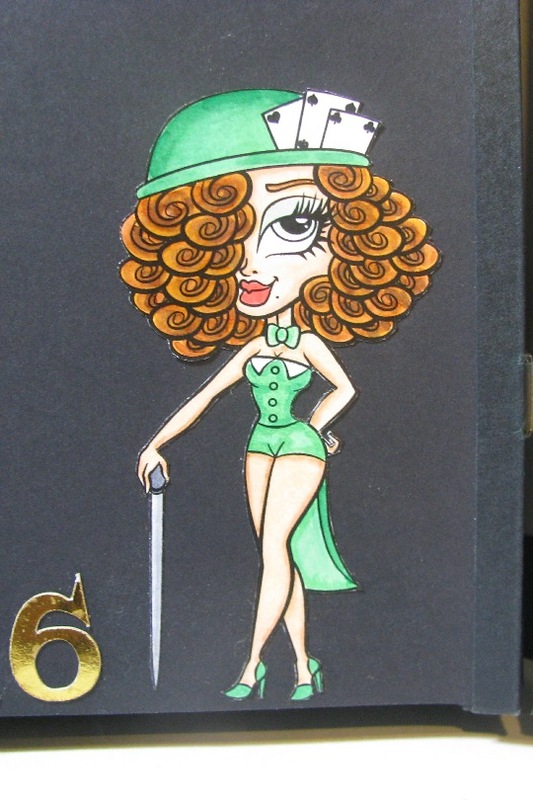 Arlene let this image color itself, or so she says for her last card this month and she couldn't help color an image that looks something a bit steampunk. 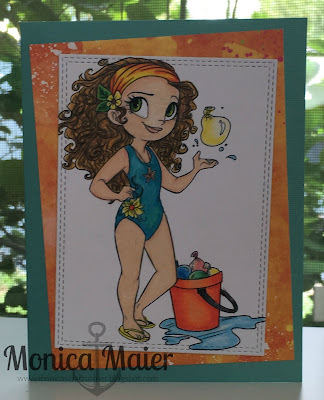 Using Water Fun Rio with a Lawn Fawn photo frame. Carol says YAY, I'm going on holiday soon! Cathie thought this little monster boy is the cutest. Thank you to everyone who also participated! Join us tomorrow for a new challenge! 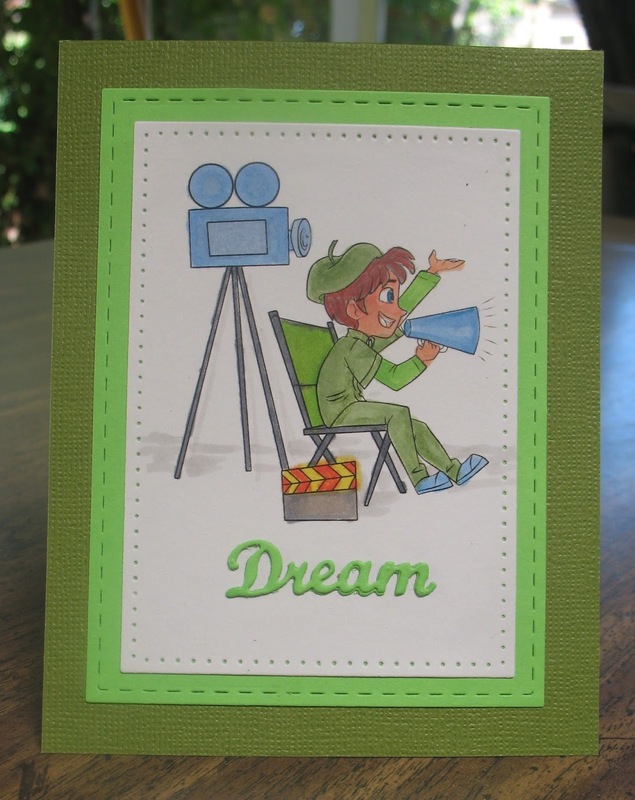 Here's another Summer Vacation card using our lovely sponsor's image. 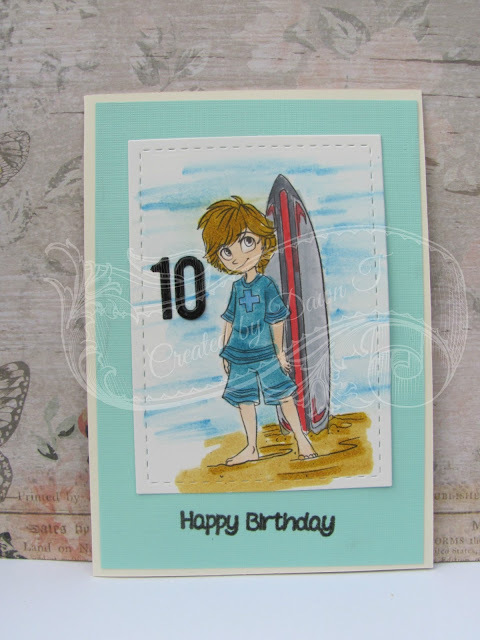 It's been a fun month using the lovely images from Simply B Stamps. Hope you have joined us... it's almost the end of the month. I hope you are enjoying the summer vacation time (even though some of our DTs are in winter down-under). 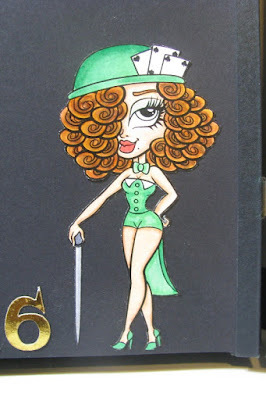 I have THREE CARDS for you! Some of us just like to relax and become the artist with a canvas to paint. Here's to summer and hanging out doing the things you want to. It's SUMMER VACATION. 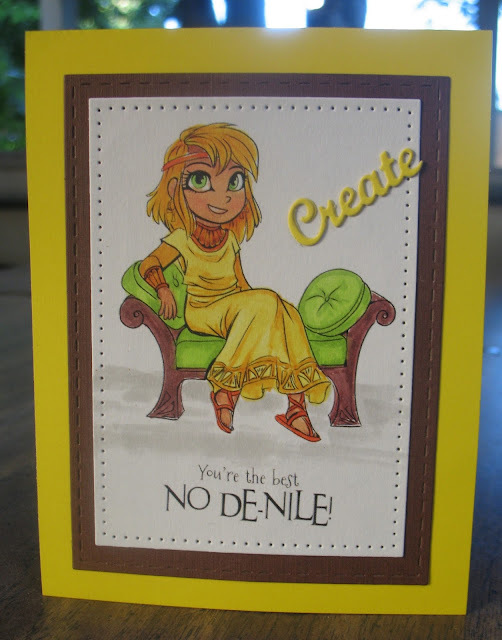 Die Cut Divas' is having a challenge based on summer vacation, so jump on in too. 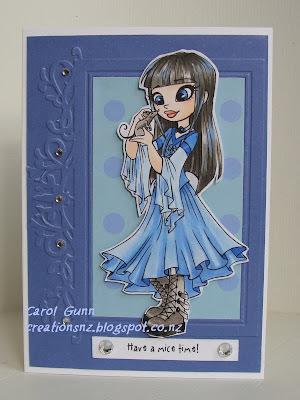 JudiKins stamp - used on the "canvas"
Isn't this image a cutie? I had to try out different colors and had to finish them so I could see how they turned out. Wouldn't you like to be sitting relaxing and not cleaning your house? That's a nice stay-cation. 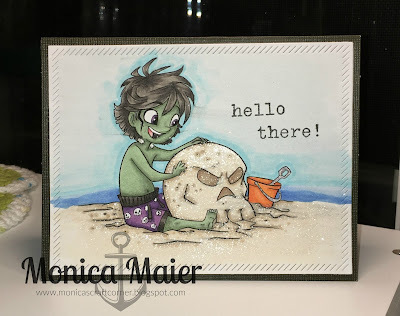 Hi everyone, Cathie here with some more Simply B and Summer Vacation Fun. It's Summer Holidays - have a mice time! How do you spend your holidays? Or, how would you like to spend your holidays? Let us know by putting your card in the challenge now! 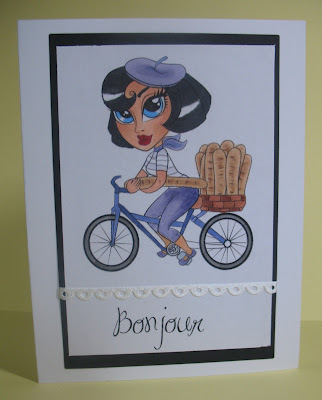 Hello all Monica here to share a card with you for our August challenge with Simply B Stamps as our wonderful sponsor. 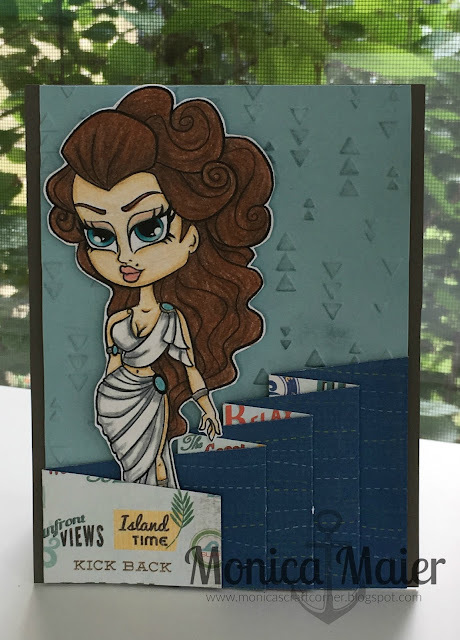 Nothing like a Greek Goddess to help with a summer vacation feel and with the summer Olympics going on I thought she was fitting for the theme. Don't forget to play along with us, we'd love to see what you have to share with us. 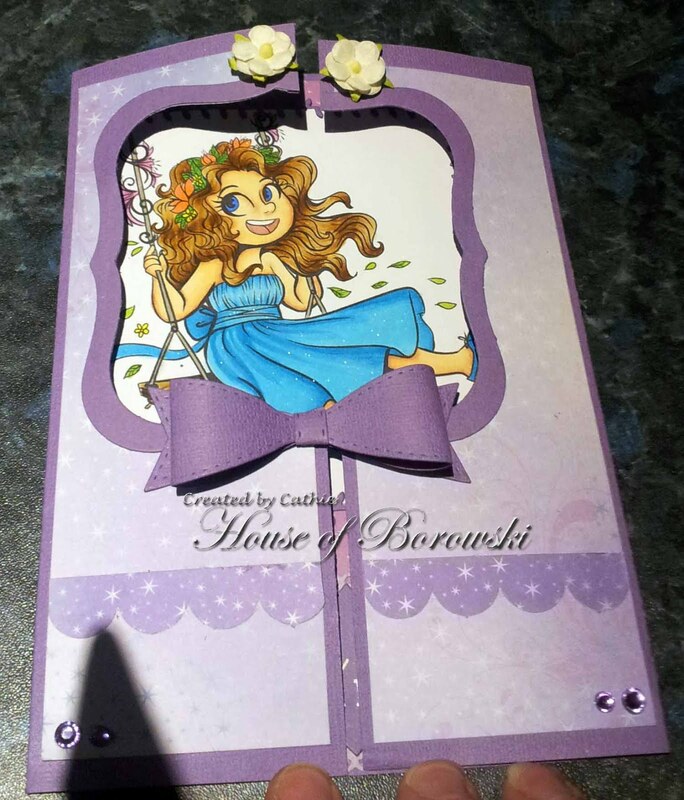 Also to see more info on my card visit my site here. 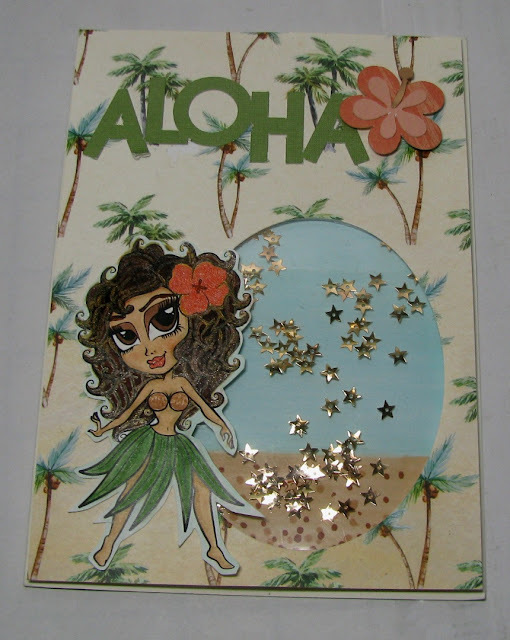 This month here at Die Cut Diva's we would like you to share with us your summer vacation, via cards or the papercraft of your choice. Just remember you must always use at least 1 die cut or embossing folder, and most of all have fun! 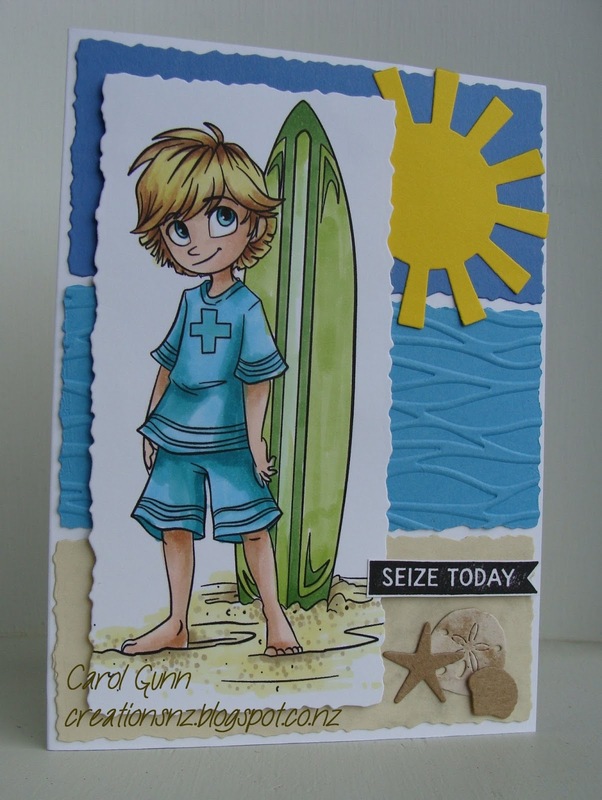 I used Beach Beauty Pin Up (discontinued) by Simply B to help create a beachy scene. I used my Cricut & the Life's a Beach cartridge to make the palm tree, and Impression Obsession Dies for the clouds. The seashell is a button I found in my mom's button box! You can find more information on the products I used at Just A Nutter Paper Crafter. 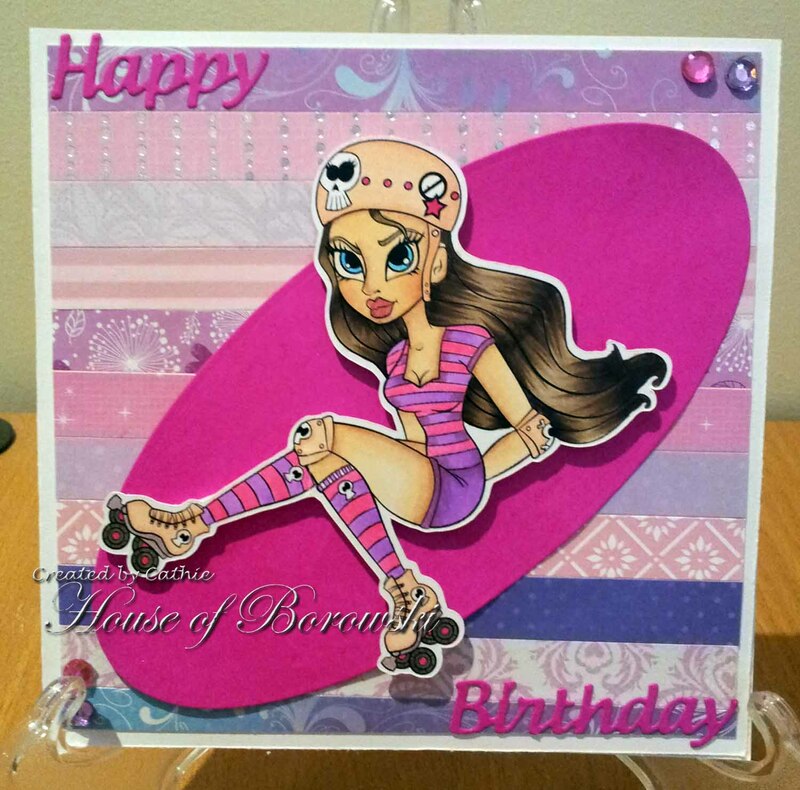 You can visit Die Cut Divas for the Summer Vacation challenge here. 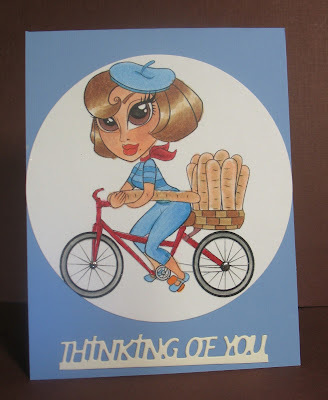 I'm showing you these cards because I fell in love with this image and just had to share my love for so many of the Simply B images, (so glad I grabbed her before she retired - cycling just became too much). I hadn't tried black hair with my Copics and I'm still learning, but I think she came out pretty cute. I do so like this image. Take a summer vacation to see a bit of France here.. Simply B French Betty (unfortunately retired) She must have reached retirement age. 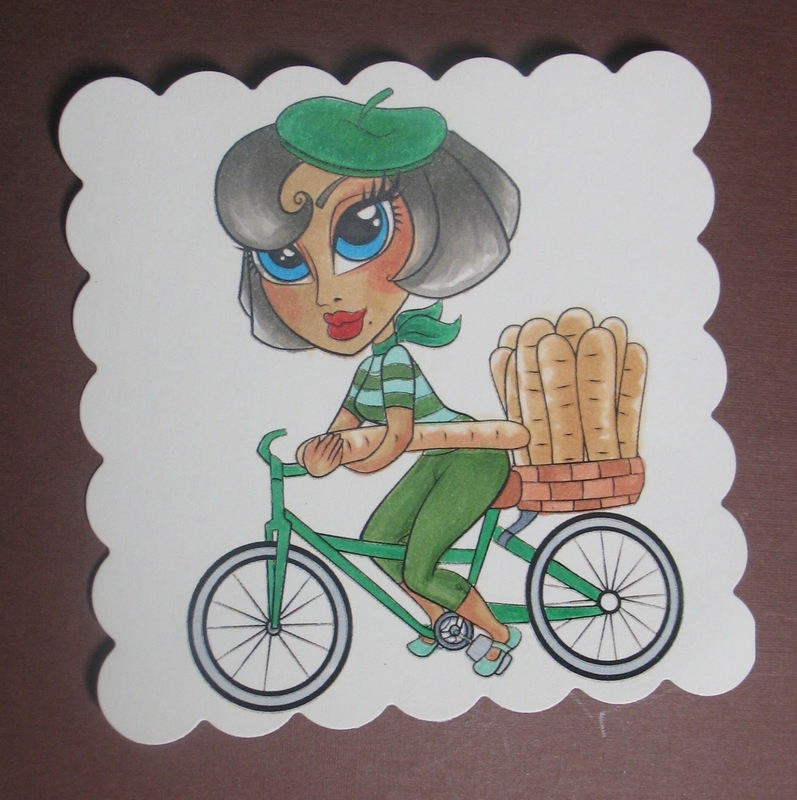 This time I made a card and she is color coordinated, including her bike. Don't you know I love this image. Take me away on a vacation with this gal. Hello there, how are you enjoying August? August often means vacation time for us in the northern hemisphere and August's challenge theme on Die Cut Diva's is August Vacation. And our sponsor is Simply B Stamps. 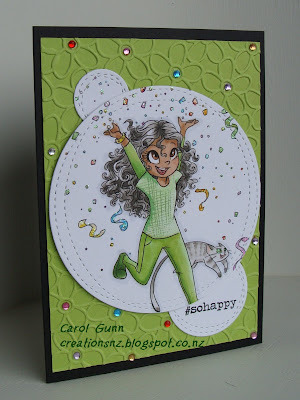 For my card today I used a Simply B Stamps called Water Balloon London Digi. I colored it with Copic markers and Chartpak markers. Isn't she fun?! Let's have a water balloon fight! What better way to beat the heat. 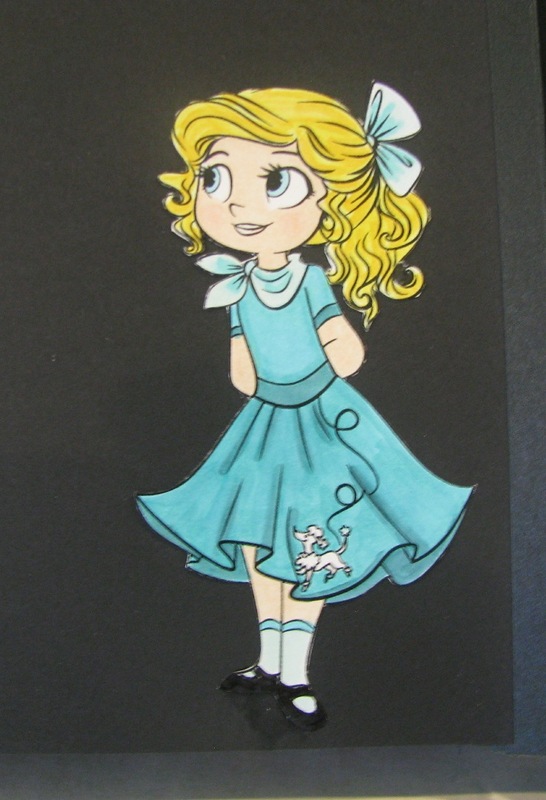 I added some glitter to her hair. Here's a close up. Hello all Monica here today to share a summery card using this fun image from Simply B. Thanks for stopping by and we can't wait to see what you have to share with us! It's All About SUMMER VACATIONS. 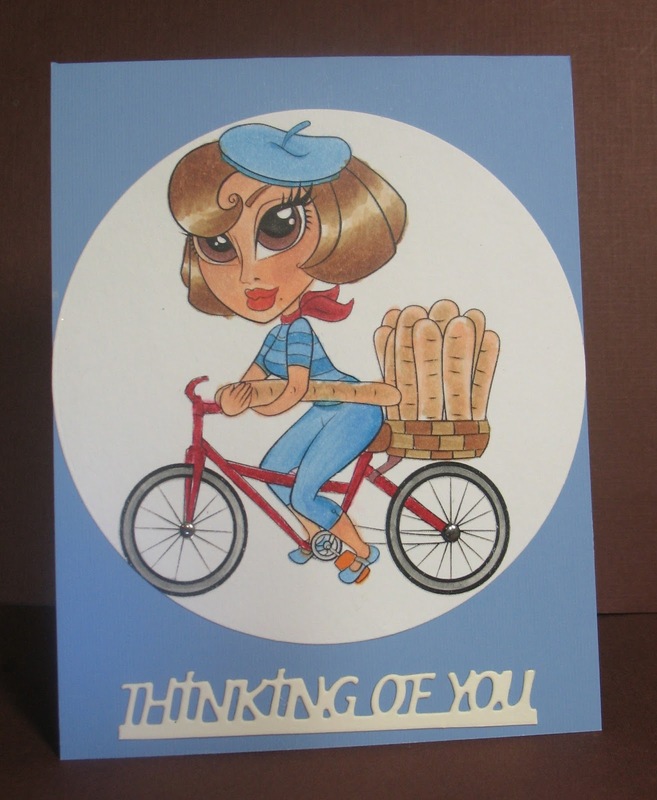 Two cards just for you! don't forget to visit A Bit of This and That. It's HOT in Sacramento in August, so this little lady is hot. This photo makes her look much oranger than she really is. There is much more shading in her hair than showns here. All in all, she really is pretty darn cute and is the stock picture of a California gal. I had great fun coloring. Do you ever dream of being in PICTURES? Or become a director for the summer? This guy is making his dreams come true. One of these days, I will go to Hawaii. It's a dream vacation for me. 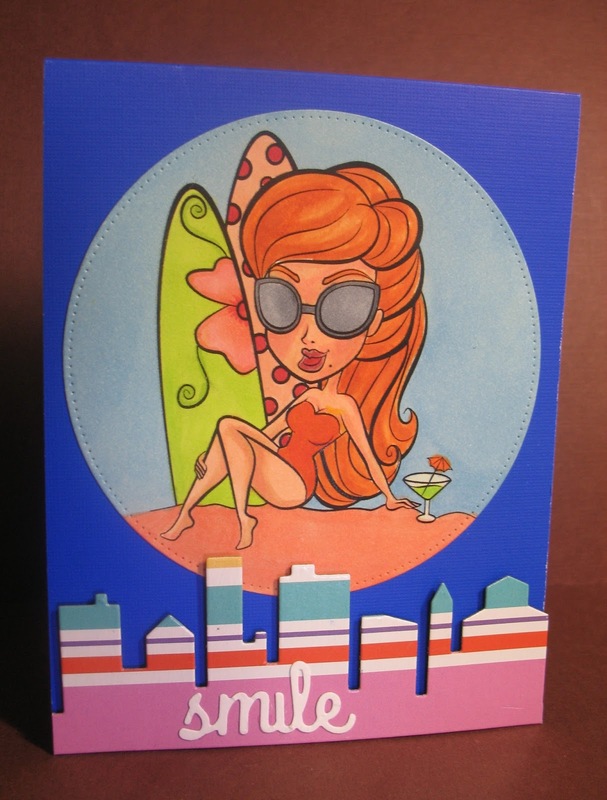 And since our theme this month is vacations, I chose to make a shaker card with a tropical twist! 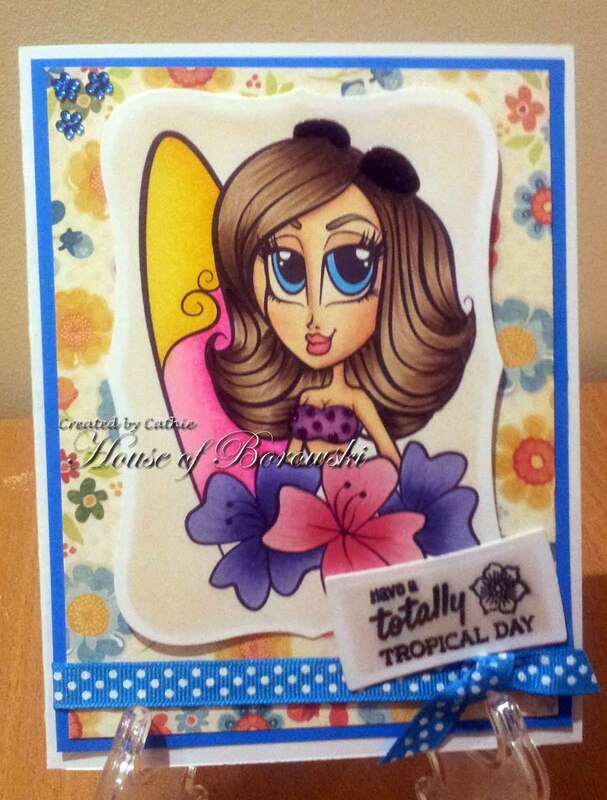 I made a shaker card with Hawaii Betty! I used a My Favorite Things Oval Die to cut into the background designer paper, then used used my Copics to color in a beach & sky, along with Hawaii Betty. 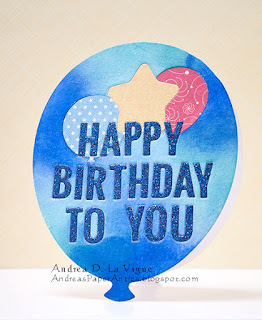 The sentiment was cut with my Cricut using the Life is a Beach cartridge, and scraps from my stash. 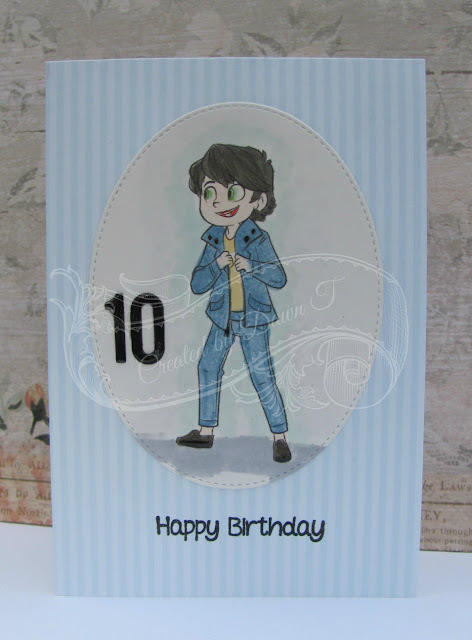 You can visit me at Just a Nutter Paper Crafter for more information on the materials I used. Simply B Stamps as our sponsor and Betty Roberts, the owner has agreed to tell us a bit about herself. I had a scrapbook store in 2008 that had to close abruptly due to my youngest son being born pre-maturely. I couldn’t just stay home and do nothing. I got on a Design Team, and had always wanted to be a stamp designer. Even when I was just a store owner I would contact my favourite companies about becoming a stamp designer but was turned away. 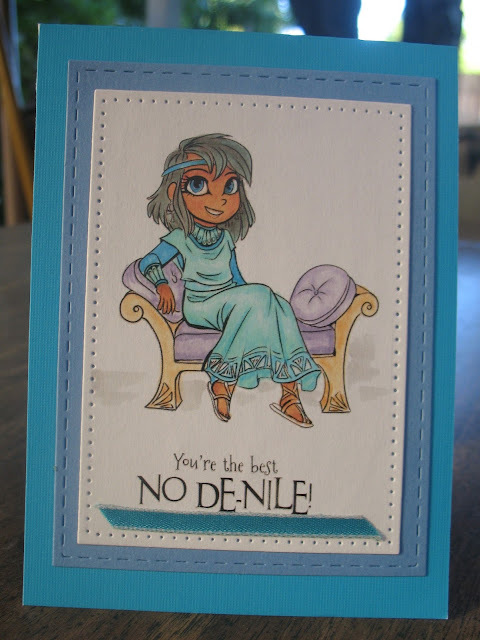 After about a year of being a DT, I took the leap and started my own rubber stamp company with the help of other artists, as I still did not know how to “make” my artwork into stamps. I also thought, no way anyone would ever want to buy my art, so I didn’t have enough confidence to put my own artwork out there YET! HA!! What is one of your favourite products and why? COPICS! I absolutely love how they bring an image to life! Hoping Your July was Glittery. Announcing the July winners. Arlene's favorite I loved the ombre colors and CAS look. 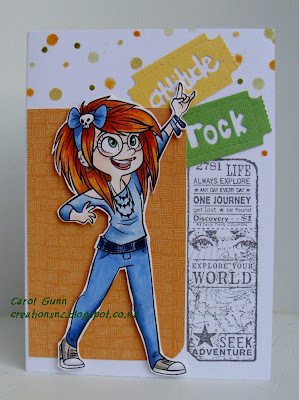 Cathie's favourite is - I love love love this sentiment, and the colouring and the colour scheme, love it all. Cindy's favorite is Kim's elegant and sparkly snowflake wreath. 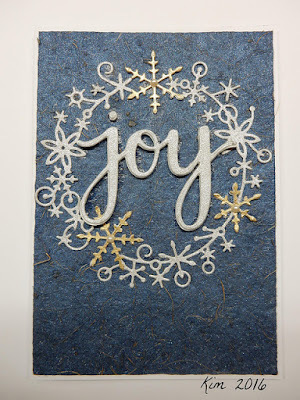 It just look so gorgeous against the texture background and it's the perfect match up with the glittery die cut sentiment. I hope everyone is enjoying a lovely summer! and either having a wonderful vacation, or enjoying the summer festivities of your own home town, this month we would like you to share with us your summer vacation, via cards ( or the papercraft of your choice), or maybe make a card sharing your dream vacation! 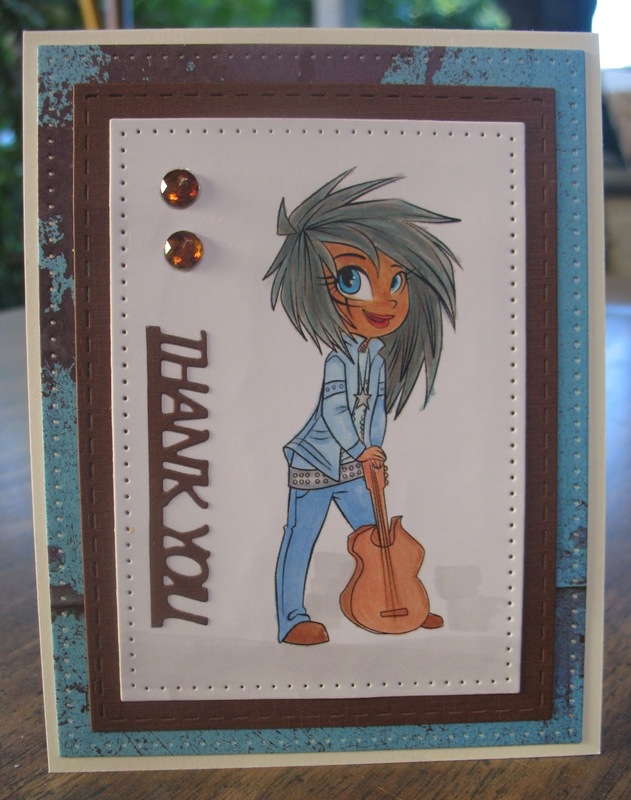 Just remember you must always use at least 1 die cut or embossing folder, and most of all have fun! 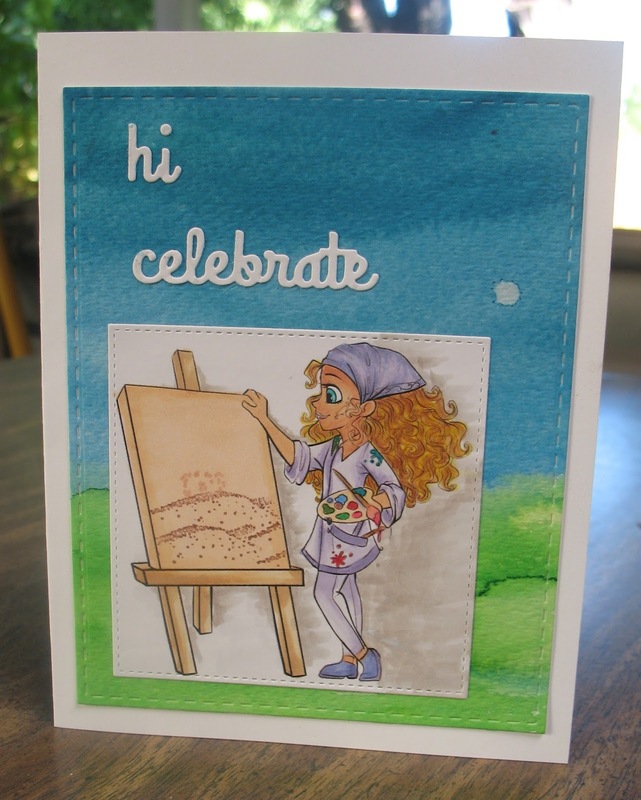 A Sample for Summer Vacations from Arlene, who obviously is dreaming of beach volleyball or some such summer sport. for her scrapbook page at Just A Nutter Paper Crafter. Cindy want to relax in the pool like Ali. 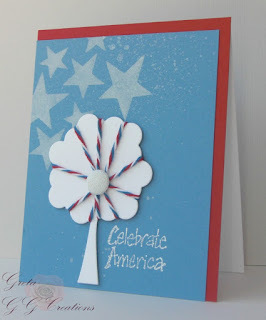 Get the details on her blog Escape To Stamping. For Cathie, Summer Vacation is all about activities in the sun, like enjoying a swing at the playground or in the garden.